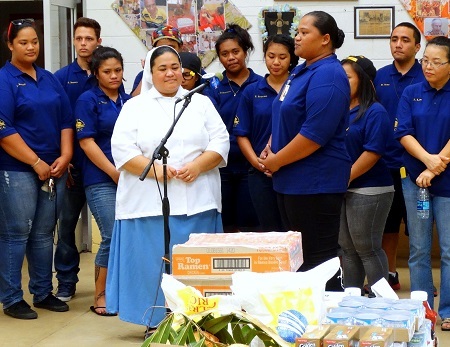 A new campus organization at the American Samoa Community College (ASCC) will enable international students to offer one another academic support while also offering opportunities for civic and social engagement. The International Student Organization (ISO) has been established under the leadership of Dean of Student Services Dr. Emilia Le’i, with Tala Ropeti-Leo of the Student Learning Assistance Center serving as the organization’s advisor. The ISO currently consists of 23 members from different cultures such as Korea, the Philippines, China, Tokelau, Germany, Tonga and Samoa, and any students of different ethnic or cultural backgrounds are welcome to join. They have elected Jennifer Tuiletuguga as President, Emily Johnson as Vice President, Jae Yang Chae as Treasurer, and Dezmond Applin as Secretary. The Organization meets a minimum of twice a month and has plans underway to become actively involved in community service as well as the campus activities hosted by the Student Government Association. As part of their initial community service project, the ISO recently held a Food Drive to assist the residents of Hope House/Fatuoaiga, to whom they presented all of the gathered food and monetary donations on Tuesday, March 25th. “Since our first meeting, our members have been very eager not only to help each other with their classes, but also to show how much they want to be good citizens by participating in community service projects,” said Ropeti-Leo. “Hope House is the first place the ISO members wanted to fundraise for.” Putting their plan into action, the ISO first held a Pickathon on Friday, March 14th at Su’igaula Utulei Beach Park. All proceeds from the Pickathon and donations from the Food Drive have gone to Hope House. Ropeti-Leo said that anyone who would like more information on the ISO is welcome to call 699-911 ext 461, 733-2690 or email ascc.isorganization@gmail.com.